Why is henna so popular and why should you try it? Here is how henna offers a completely unique experience from more common temporary and permanent tattoos. Henna is a natural herb plant whose essence has been used as an art form in Pakistan, India, and the Middle East for over 5,000 years. Ancient cultures used henna as the primary ingredient to create a paste capable of tattooing the body. In Indian culture, henna body art has been used to tattoo brides with beautiful intricate patterns before their wedding ceremonies. Henna art has also been used in Pakistan to indicate than an individual has “come of age” and reached adulthood. The ink used in traditional tattoos can contain potentially toxic chemicals; but henna is all natural. To create a henna paste, a henna plant is ground into powder and mixed with water. A few oils are then mixed in and the result is a deep red colored paste. This natural paste is then applied to you in the design you desire and removed a few hours later to reveal the tattoo. If you were going in to a shop get a permanent tattoo, you would probably work closely with a tattoo artist and come up with a design that you were happy with. The same is true of henna. Most salons offering henna have a variety of simple and complex designs for clients to choose from, but can also create custom designs as well. Henna paste is easy to work with and allows the tattoo artist flexibility to create either modern tattoos or more traditional designs. This means that henna can be used to fit any tattoo style that is desired. At Threads, clients are encouraged to bring in their own designs for our artists to follow. Because there are little limitations to what henna can do, our artists are allowed to create beautiful and unique designs matching each client’s personality. Obviously, the biggest fear people have about tattoos is being stuck forever with a design that they no longer want. 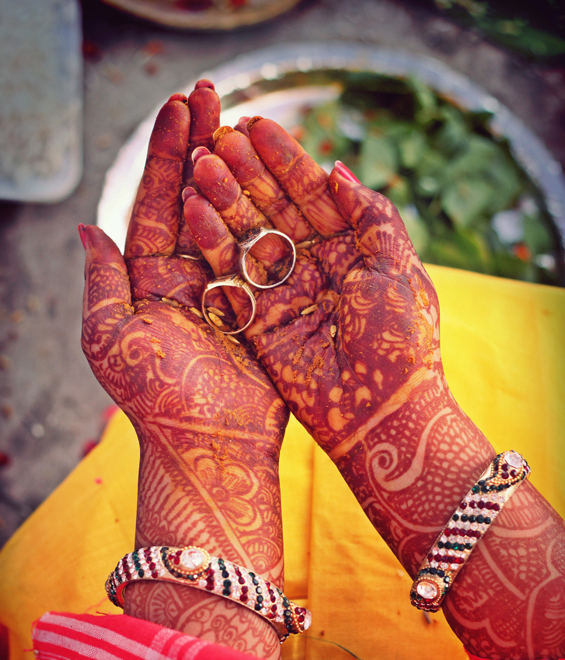 Fortunately, henna tattoos are temporary and do not require a life-long commitment! How long a henna tattoo lasts depends on a number of factors including: how long the henna paste was left on, where the tattoo is located, and how quickly the individual’s skin exfoliates. Typically, a henna tattoo will last anywhere from 7 days to a month. So, while henna is temporary, it is not too temporary. You will likely get a couple of weeks to enjoy your henna design and show it off to your friends and family before it is time for a new one. The henna paste application process is completely pain free. Instead of having to suffer through being punctured by an inked needle, the paste is simply applied using a cone like the kind you would see being used to decorate to a cake. After a few hours, you can peel off the paste to reveal your tattoo underneath. The peeling off process can be done with a spoon or a spatula and should not cause you any pain. By this time, the paste will already be flaking off and will come off of your skin easily. A permanent tattoo can cost you hundreds and even thousands of dollars. This is not the case with henna. Our henna pricing starts as low as $10. Pricing with henna typically depends on the size of the tattoo and how much fine detail goes into it, but you can be sure you will not be paying anywhere near what you would for an ink tattoo. Your henna tattoo will look just as good as ink but cost a lot less. Plus, if you don’t want to keep it, it will fade away over time! The best reason to try henna is because it is fun! Henna tattoos are perfect for events like weddings, birthdays, or just a girl’s night out. Everyone will enjoy these safe, temporary, customizable, and inexpensive temporary tattoos. Threads offers travel events so that you can have all the fun of henna tattoos at your family gathering or professional event.